It is not difficult to see members of our Judo club wear short pants and sleeveless shirts these days. It is nearly hot summer now and we have many important events ahead. 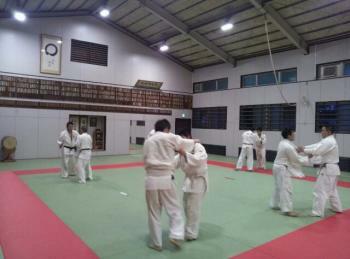 Today we practiced Judo with the same menu as usual. Today, Mr. Kita, an alumnus of Saitama University gave us the honor to learn from him. Although freshman Kaito-kun, and Ariyoshi-kun had already acquired black belt long before and are already well-trained warriors, as they have been accustomed to international rules, our usual menu that is well balanced with Newaza and Tachiwaza might be something fresh for them. Captain Takahashi said that even Sanshodaisen is now prone to be tilted to Tachiwaza more than Newaza recent years. It still remains that Newaza is important to represent our tradition and identity. 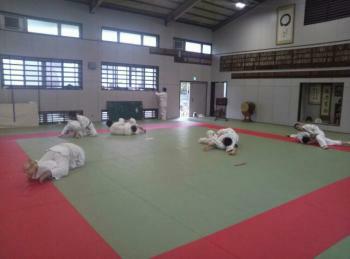 Now most of freshman students have grown strong enough to bear the rigors of Kametori during the Newaza Randori. Thus we are going to our exit from the level of Osaekiri and to move on to the next phase of our practice. Mr. Kita encouraged us to stand Randori with passion. During the Randori, we were able to watch continuous development of attack and defense; diamond cut diamond. After the Tachiwaza Randori, Mr. Kita taught us Kuzushi, the basic step for Nagewaza. He taught that Nagewaza is comprised with three parts; Kuzushi, Tsukuri, and Nage. Kuzushi is the most important factor among the all. He emphasized swiftness and flexibility on the ankles and arms, and the sound from the Judogi is the barometer that we are doing well or not. We are going to return to the basic principles again, and practice as we were taught to do. Many teachers have emphasized the importance of basics. Mr. Kita foretold that he would teach us many other applications of Kuzushi we learned today. We give our gratitude to Mr. Kita for providing meaningful lesson to us today. With 7 new members, we shall make our stand toward to the victory.